A “self-proclaimed recruiting nerd,” Stacy is the founder of The Talent Agency, a recruiting consultancy and R4R search firm that helps companies recruit Talent Acquisition professionals. With 21 years of recruiting experience under her belt, she has plenty of success stories and has also made plenty of slip-ups. 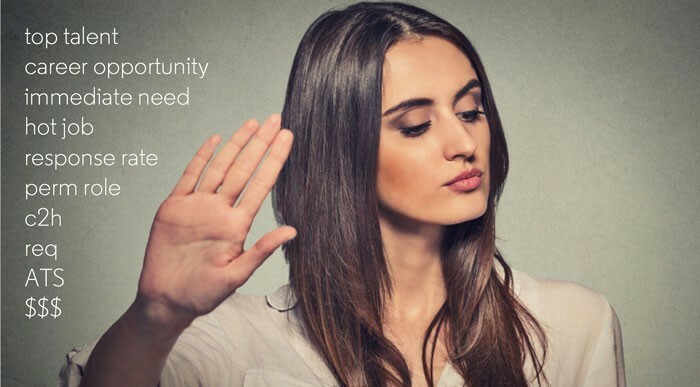 In her top-rated talk at LinkedIn Talent Connect 2018, she tackled the latter head-on, including why recruiters get a bad rap and what we can do to change that. 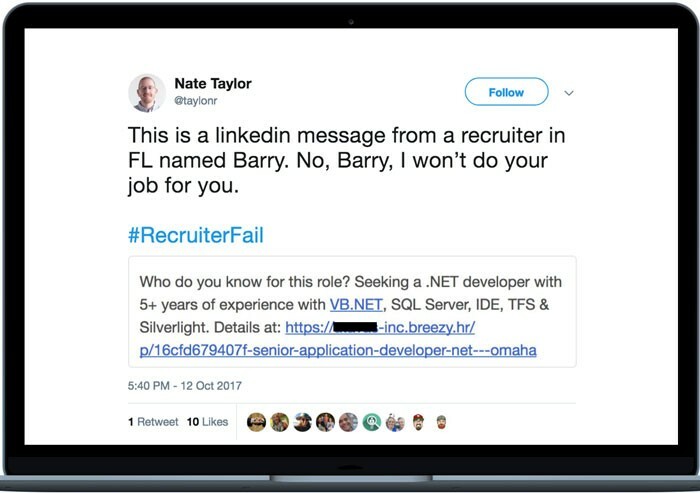 Don’t fall victim to a #recruiterfail. 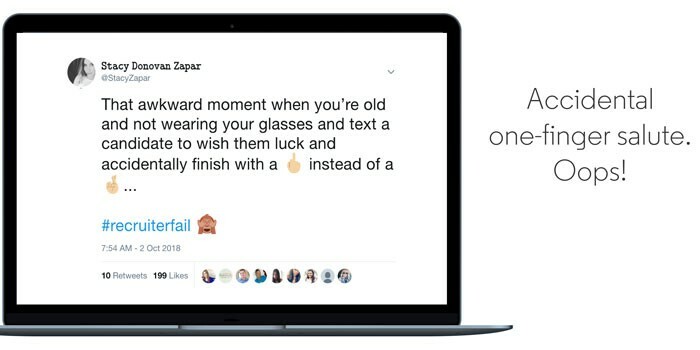 Before you send another message to a candidate, here are eleven of the most common and cringe-worthy outreach mistakes to watch for — and Stacy’s tips for both avoiding them and improving your response rate. Also have deep-dive intake meetings and take the time to listen to hiring managers review resumes. 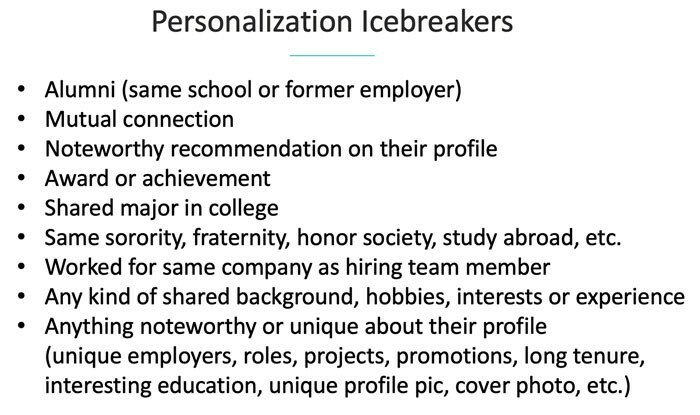 This will give you a better idea of what an ideal candidate looks like and which skills and traits are most important. If you’re not sure where to start, you’re in luck. 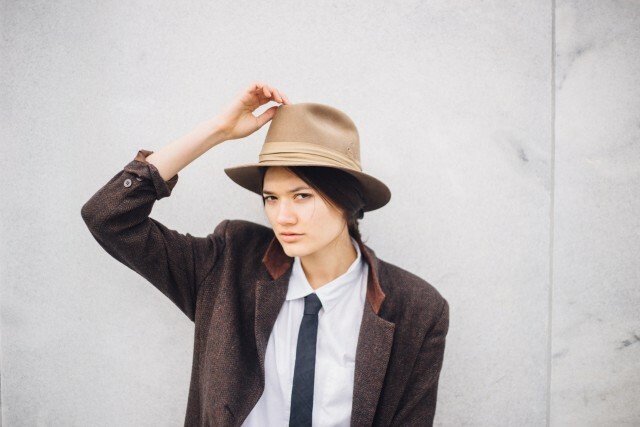 Stacy has compiled all of her favorite resources in one place. When recruiters are in a hurry, these are some common mistakes: Contacting a 16-year veteran for a junior position because yes, technically, they do meet the two years’ experience requirement. 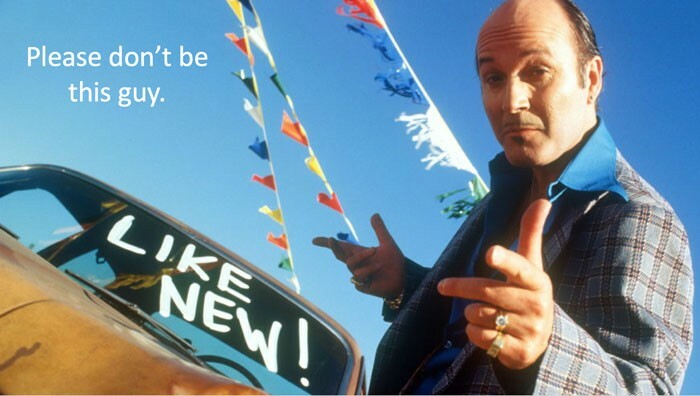 Telling a candidate they’re a great match for a company… where they already work. Copying 60 people on the same email message, telling them how special they personally are. Stacy has seen a lot of these “spray and pray” mistakes, and says they only serve to let candidates know you’ve done a quick keyword search. Rather than contacting the 500 people who matched a single keyword, Stacy uses an approach that she calls “tree ring sourcing.” This involves starting very narrow and gradually broadening your search as you go. 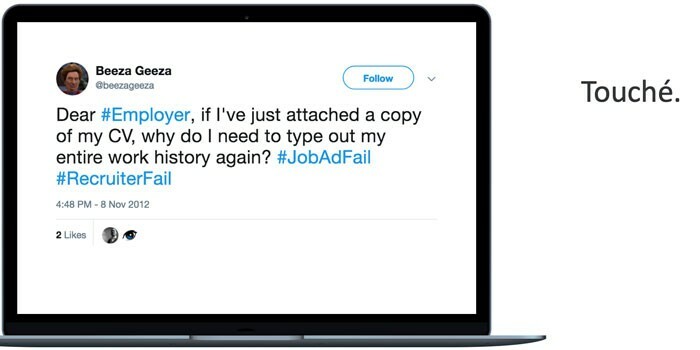 Copy and paste can be the death of your credibility. 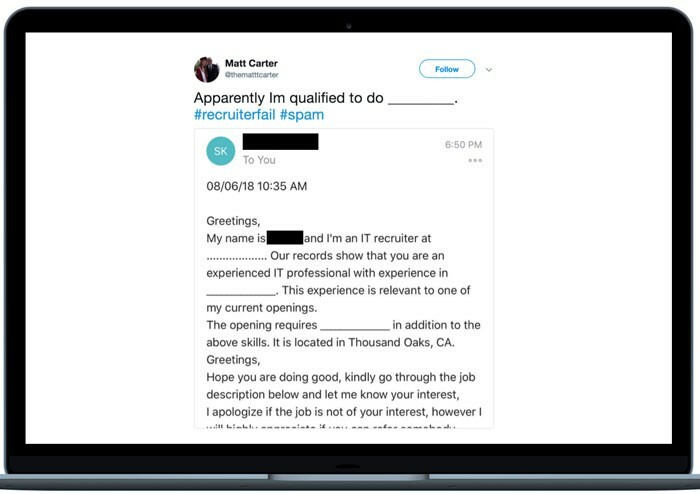 While it’s fine to use a template, forgetting to give your outreach messages a thorough once-over can lead to all manner of embarrassing slip-ups — from calling a candidate by the wrong name to leaving all the blank spaces in. Oops. Mail merges can also cause trouble. When autofill goes wrong — like the candidate’s name going unfilled — it doesn’t make people feel special. 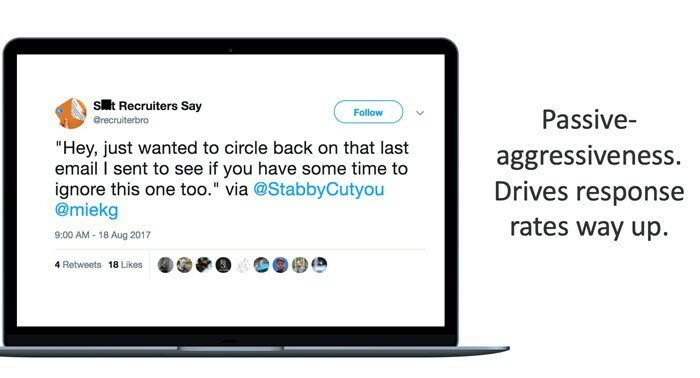 That’s why Stacy recommends adopting a “measure twice, cut once” mindset. Set up a guinea pig account or two, do a test run, and take a close look at the message before it gets anywhere near a candidate. 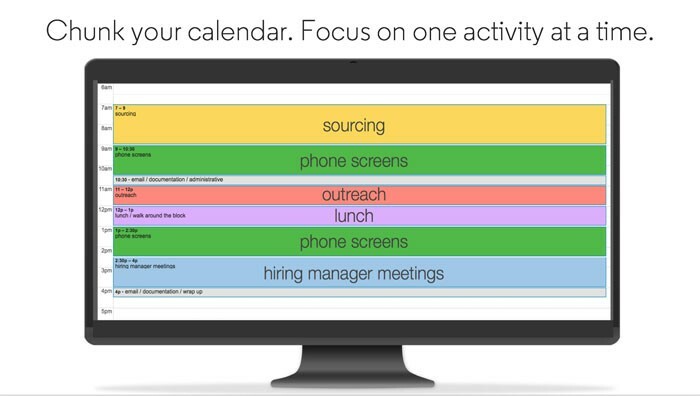 To cut out distractions and avoid making mistakes while she’s sourcing and reaching out to candidates, Stacy blocks off time on her calendar — and lets everyone know not to disturb her. No matter how psyched you are about a candidate, don’t overwhelm them with a first message that looks like a novel. 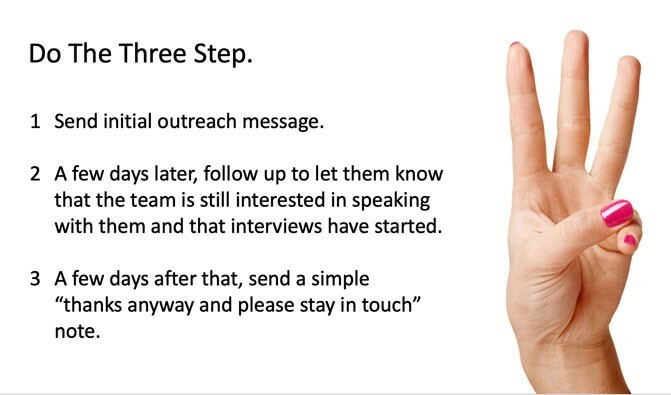 Remember that the goal of that initial outreach is just to get the candidate to talk to you, not to sell the role or the company. You can talk about their goals and desires later, when you get them on the phone and understand their motivators. Stacy also uses Glen Cathey’s method of digging into the person’s connections herself, rather than asking them to come up with names for her. 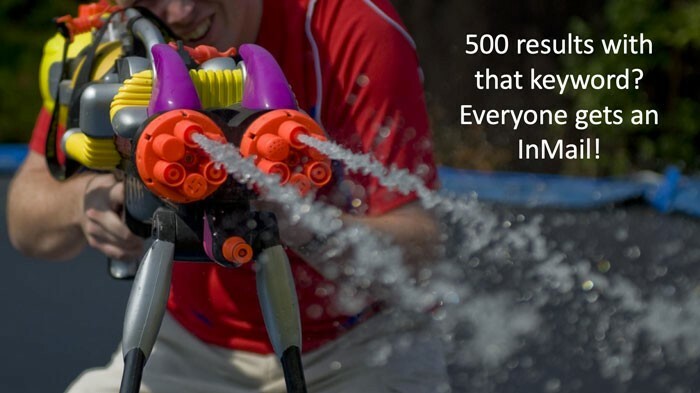 Don’t ask them who they know… tell them! Every occupation has its own secret language, and talent acquisition is no different. While terms like “top talent” or “hot job” make perfect sense to other recruiters, Stacy argues that this kind of language can be really off-putting for candidates — or completely incomprehensible. Most candidates, for example, don’t know what ATS, perm, or c2h even mean. 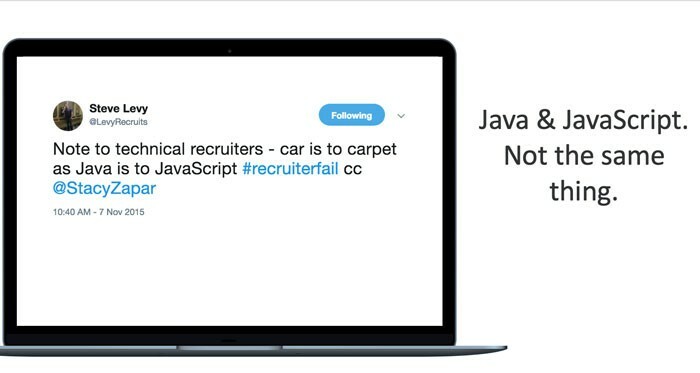 Before hitting send, step out of your recruiter shoes. Ask yourself if the message is easy to understand and also shows some personality. 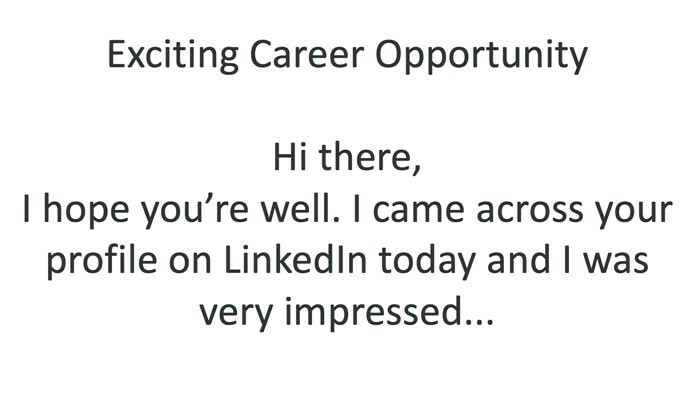 Don’t fall into “recruiter speak” if you want to build rapport and get a response. Showing some personality is important, but there’s a fine line between funny and cringe-worthy. For Stacy, dad jokes, calling the candidate “bae,” and constantly referencing the Matrix to techies are prime examples of crossing that line. 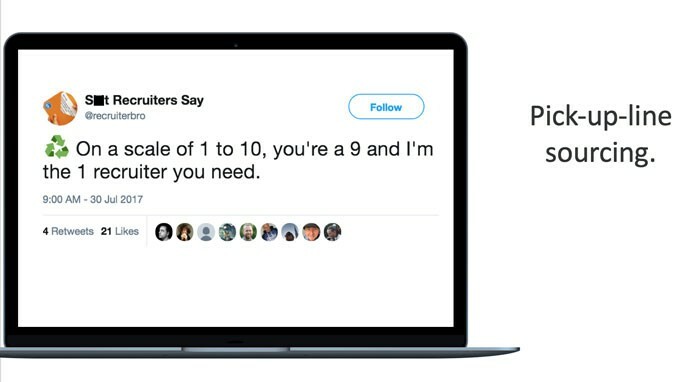 As a golden rule, Stacy says your messages should take the careers of the people you want to talk to as seriously as you take your own. Giving candidates a little nudge can often drive a response from someone who didn’t respond initially. But be careful that you don’t come across as pushy or passive-aggressive. Stacy uses a three-step process to stay on candidates’ radars without becoming a pest. This method is noticeably effective. Stacy says her initial response rate of 45% leaps to 65% by the second message, and 85% by the final nudge. 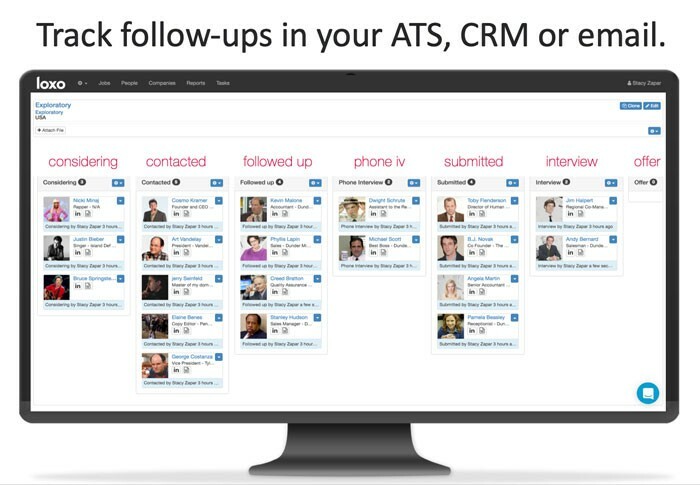 She recommends creating a system for following up, whether it’s email folders, paper resumes in stacking trays, or setting up your ATS or CRM to remind you after a certain number of days. 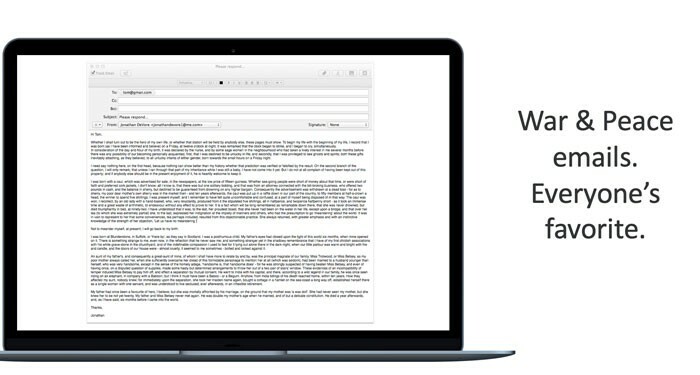 You can also use an email tracking tool like Mixmax or Hubspot to track your open rates. Of course, some candidates just won’t respond to you no matter how carefully crafted your follow-ups are. In these instances, Stacy advises leveraging your team again. 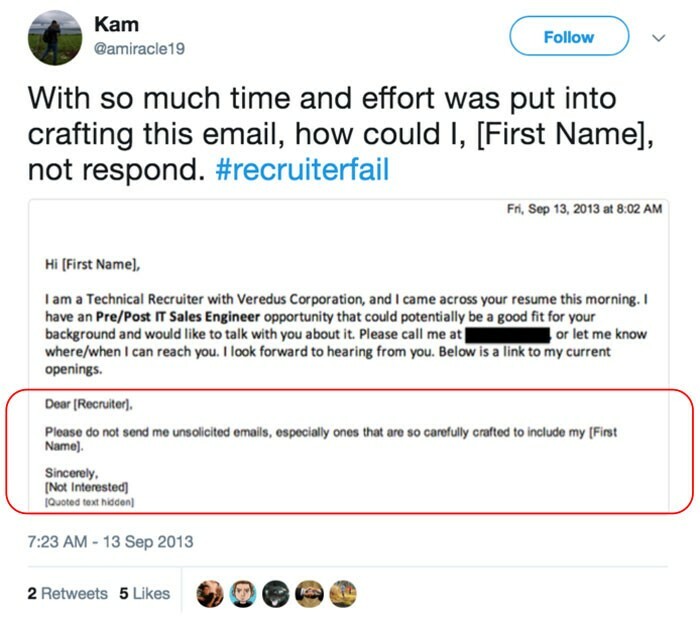 Everyone has applied for at least one job that asked them to type out their entire work history… after already uploading their resume. 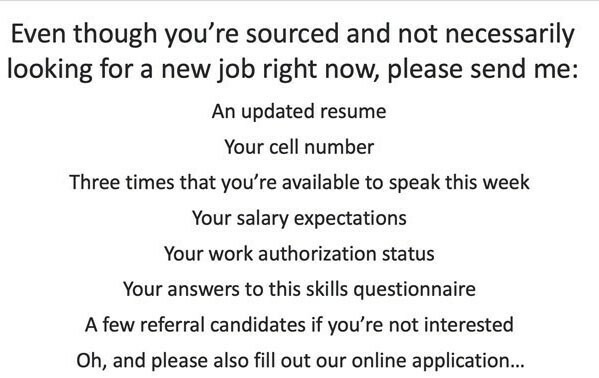 While this kind of hoop-jumping exercise is annoying for applicants, it’s especially aggravating for candidates you’ve sourced. Stacy says that asking sourced candidates for things upfront can immediately sour the relationship. To make the process as easy as possible for candidates, Stacy recommends using tools like Calendly, YouCanBookMe, or LinkedIn Recruiter that allows candidates to self-schedule a time to talk. But whatever you do, always show up and try to be on time. 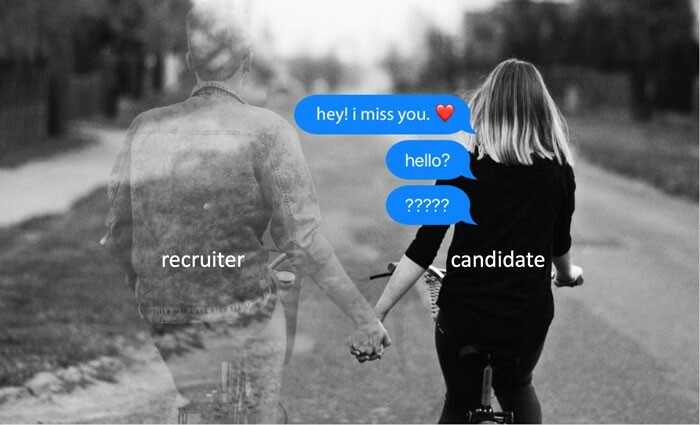 In Stacy’s eyes, the biggest recruiting fail of them all is ghosting candidates. To ensure no candidate feels ignored, Stacy blocks off a two-hour slot on her calendar every Friday afternoon to send every interviewee an update. She calls it her Friday Feedback Blitz, and says it gives both her and her candidates peace of mind. If these recruiting fails make you cringe, you’re not alone. Everyone slips up occasionally, but it never hurts to confront your past mistakes head on and try to learn from them. “Treat your candidates the way you’d like to be treated and you can’t go wrong,” Stacy says.